A Devon White water selection. Here is a short video of a few bits of river they paddled over the weekend they were here. 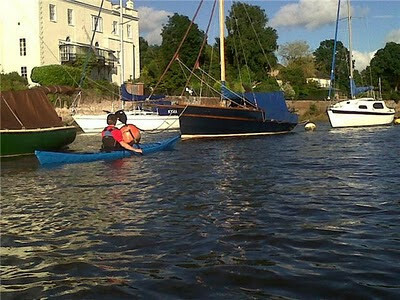 The Waters around AS Watersports offer a fantastic variety of Environments for paddling. With in half an hours paddling from the shop you have three weirs, which, depending on levels, can be a great intro to whitewater or the best play feature in the South West. Further down we hit the tidal section of the river. This section is super quiet and very attractive and packed with plenty of wildlife. 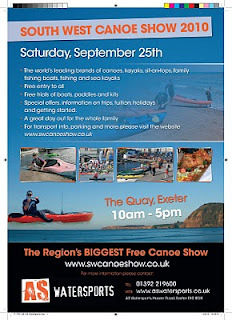 A fantastic spot for Sea kayaks, Sit On Kayaks, Touring Kayaks and Open Canoes. 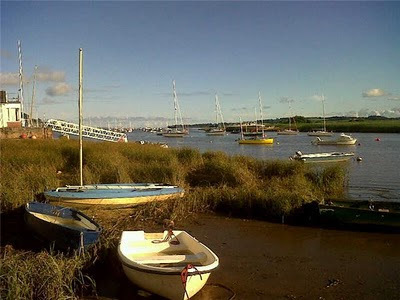 Running alongside the river there is the seven miles of flat sheltered water of the Exe canal, with easy access, good shelter, no currents this is an ideal learning ground. Using the river and tide to flow down the Estuary and the canal to work your way back up is a fantastic round circuit bypassing all the weirs. We offer this as a day trip course for £40 running through the year. We provide all the equipment our inhouse experienced instructor has all the local knowledge to show you the routes, access points as well as packing in loads of top tips to make you a better paddler. Last night our inhouse Instructor Liam Kirkham and Ewart Aylward took advantage of whats on there Doorstep. Fantatsic paddling with good sightings of Cormorant, Herons, Little Egrets and Kingfisher. Here are some photos to wet your appetite! Too Book onto the next course (August 1st 10am - 4pm) call now or have a look at out coaching page too see what else we can offer. 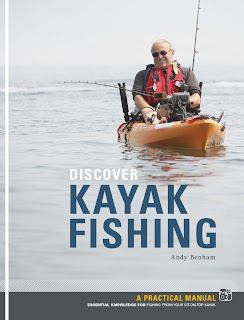 Discover kayak fishing is a new book from Pesda Press. 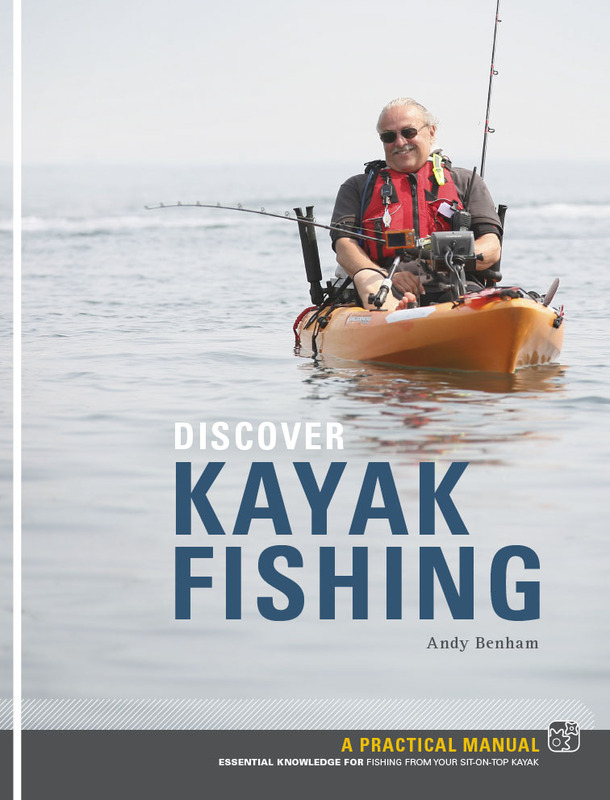 The latest publication from Pesda Press is Discover Kayak Fishing by Andy Benham. This is the first book on the subject published on this side of the Atlantic, with our different fish species, techniques and approach. Andy is a specialist magazine journalist with 25 years experience, much of it for angling magazines. He is totally addicted to kayak fishing and hopes that his book can impart some of fun he has had and some of the lessons he has learnt. The book is aimed at the angler who has taken up or is curious about kayak fishing. Experienced kayakers will also benefit from Andy's kayak fishing wisdom. 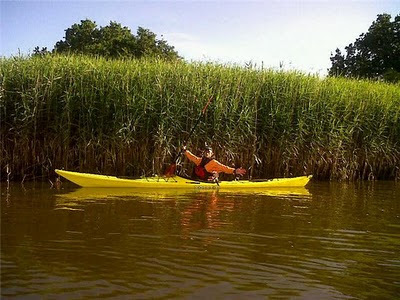 Choosing your fishing kayak and equipment. Practical tips on modifying your kayak and installing a fish finder. Kayaking with confidence and staying safe at sea. 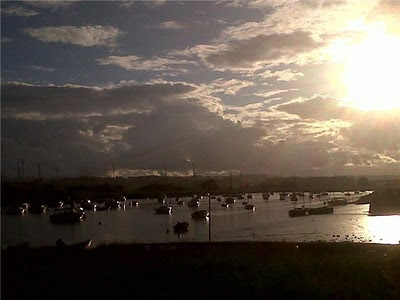 Seamanship; tides, weather and charts for anglers and kayakers. Using handheld GPS and VHF radios. Fishing skills; top tips on anchoring and 'downtiding' from your kayak. What to fish for; Andy's tips for catching your favourite fish. And more, including freshwater fish and wreck fishing. 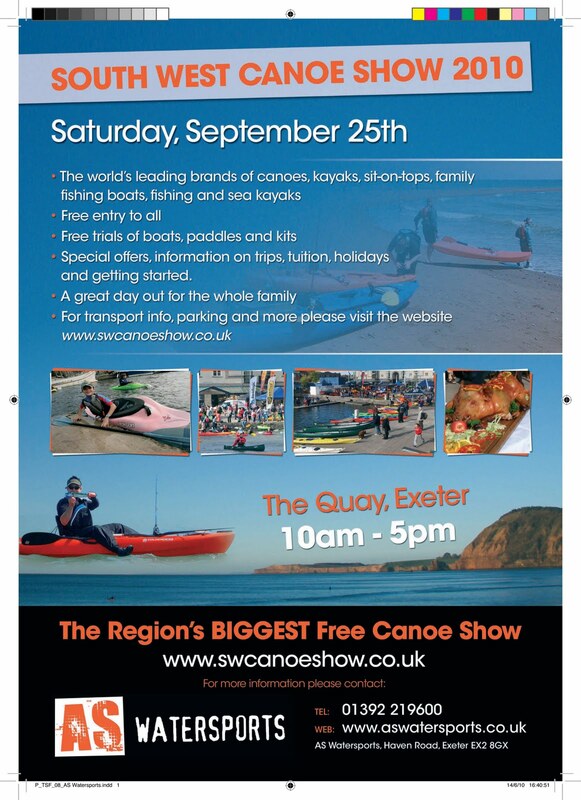 Andy will be at the Pesda Press stand at South West Canoe Show Saturday 25th September 2010 to sign copies of the book purchased at the show. We took part in a little promo video for a new outdoors website, UK Active Outdoors. The site is geared at gving information to those who are looking to get into all kinds of outdoor activities. Kayaking with UK Active Outdoors from Five Element Productions on Vimeo. Rodeo Raft, a day rafting and kayaking in France. Ewart has just come back from a trip to France and Spain. Whilst he went with his downhill bike to the bike parks and ski resorts of Spain and Andorra he also managed to squeeze in some paddling. Ewarts friends Sam (front left) Mike (front right) and Grace (2nd right) enjoy the warm up rapids. His friends got in a raft and Ewart managed to borrow a Riot Sniper and some kit for the afternoon to join them. He wasn't to keen on the rafting after seeing the river, he wanted to paddle it! The beautiful Gorge de Pierre Lys, River Aude, Pyreness Orientale, South West France. A fantastic class 3+ limestone gorge. 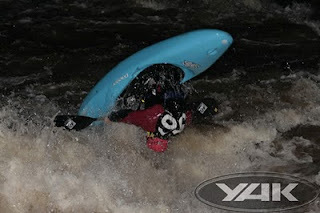 Great little tecnical rapids and a nice class 4 drop to finish. The valley is beautiful with oak and beech trees lining the hillsides. Strike a pose Ewart! Actually, put it away. The last but one drop, good 3+. Lots of fun to run blind. Lots of thanks to the Guys and girls at Rodeo Raft in Belvianes near Quillan. The centre is about an hours drive from Carcassonne and a great area to visit with lots more white water potential. The best time to visit is in early spring with the snow melt and a bit of rain fall. We got a dam release in the afternoon but Rodeo Raft can help with locations. They also do canyoning, duckys (hotdogs) and hydrospeeds. This is the advert we have placed in our friendly fishing magazine, Total Sea fishing. Its usually a bit quiet for new products at this time of year. So its always nice to get somthing in. Typhoon have come up with a couple of nice touring and general purpose items which suit the season very well. Along with the cags they also have a very reasonably priced pfd and some great value snorkle sets. All absolutly perfect for this time of year. The Mekong pfd sells at £34.95 and is perfect for all thsoe sit on top kayaks or just abit of old fashioned mucking about. Soft foam make it very comfy, two side adjusment straps to ensure a firm fit, a pocket in the front for your keys and ice cream money. We include thses pfds in some of our kayak packages. 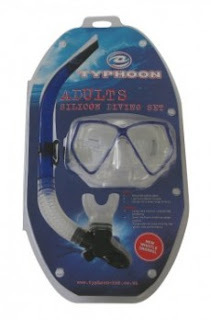 Buy online here Tm2 snorkel sets are perfect for summer fun. Chuck one in the back of your boat for some rock pool exploring. Dont miss out by going here. The cream of the crop, the Typhoon Amur touring cag. A two layer touring cag for spring and summer use sea kayaking, touring and general paddling. Its always good to have a nice light top you can keep stashed in your boat or under the deck lines to chuck on if the weather turns or is maybe a bit breezy when you set off. The Amur has good firm sealing cuffs with plenty of velcro, a nice wide neoprene waist band for a dry seal, front pocket for keys and ice cream money (a recurring theme for A.S Staff). 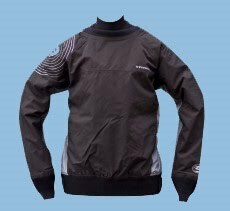 We particularly like the fairly high collar with its soft fleecy mesh lining and pack away hood. The hood is a good size and will go over a hat and has a stiff peak (but not to stiff) with some high viz reflective taping. RRp £84.95. 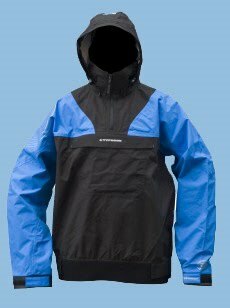 This cag goes up against the Palm Greenland, Delta Pathfinder and Peak Tourlite Hoody and comes out pretty good against all of them. Check one out instore or purchase online. Surfs Up! Typhoon Bering sea semi dry top. Perfect for sit on top kayak surfing and the slightly wetter side of general purpose. You can even use this top for sailing or other watersports. With very soft feeling neoprene neck and wrist seals the Bearing Sea will keep the worst of it out. 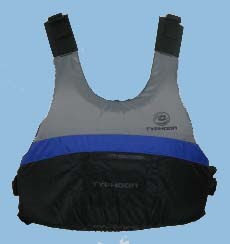 Not as dry as a latex seal cag or one with a twin waist its great for summer temperatures and paddling. The wide neo waist seal holds onto your leg wear well to stop it riding up and creates a a pretty good seal.